The Beatles? Sgt. Pepper? Abbey Road Studio? George Martin? Modern recording techniques? Learn all about these subjects as we celebrate the 50th annniversary of the release of this classic album. Rolling Stone called Sgt. Pepper’s Lonely Hearts Club Band “the most important rock & roll album ever made, an unsurpassed adventure in concept, sound, songwriting, cover art, and studio technology by the greatest rock-and-roll group of all time.” Learn about it from multiple angles as Freiman explores the history behind the music and the Beatles’ innovation in the studio. 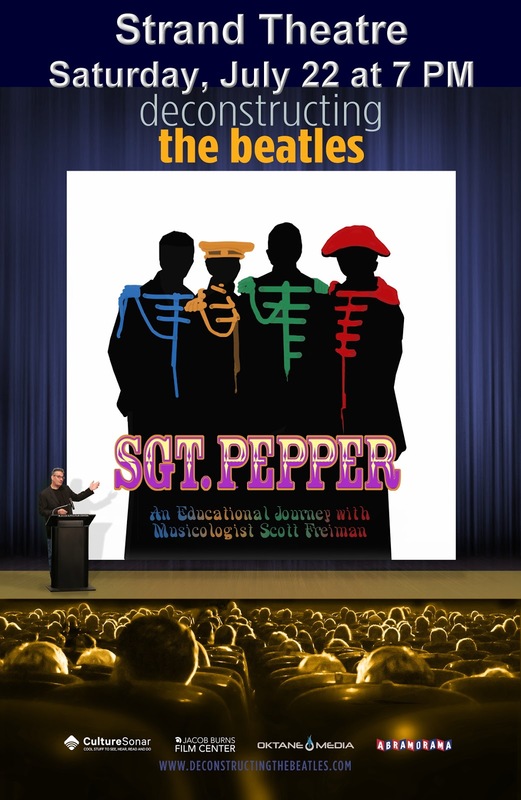 After a few years of hosting Scott Freiman’s incredibly engaging series, Deconstructing the Beatles,the Jacob Burns Center is now proud to be filming his performances, which will allow them to be distributed widely. And now, the Strand is proud to present this cool program. 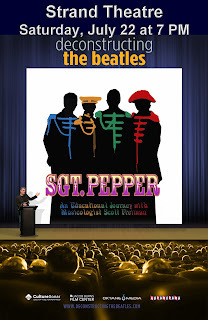 Scott Freiman combines his love of the Beatles with his experience as a composer, producer, and engineer to deliver unique multimedia presentations about the band’s creative process. With rare insights, anecdotes, film clips, and recordings, he takes audiences on a journey through performances and recording sessions, allowing viewers to see and hear the evolution of groundbreaking songs and understand their lasting influence on popular music. Freiman has composed music for more than 10 films, as well as the Emmy-award–winning BBC/Discovery series Life. The show starts at 7 PM on Saturday, July 22 at the Strand. Discount advance tickets are available at Highway 61 Coffehouse. Music is great and unique. I will share similar and unique ringtones to you.